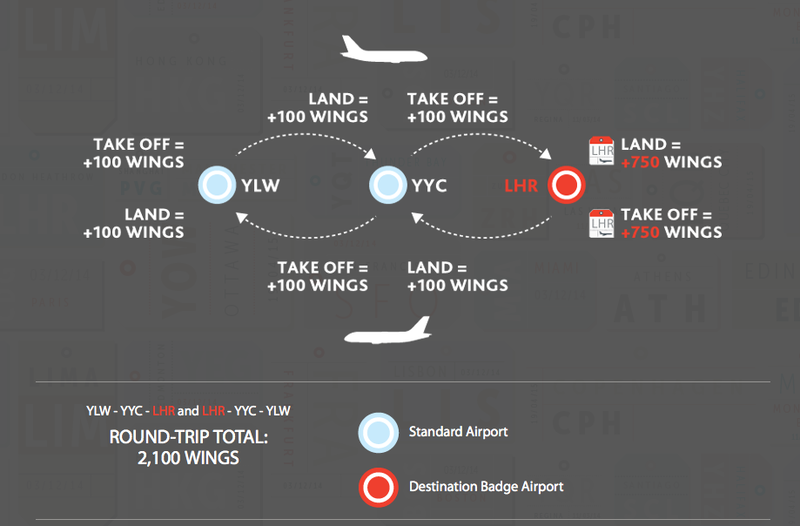 On Tuesday we brought you a quick synopsis of the newest version of Air Canada's Earn Your Wings promotion. This third incarnation of one of our favourite promotions for Canadian's sees eligibility tightened up as it is only available to Air Canada Altitude members. One could consider this a true frequent flyer promotion as almost all of the earning and bonus opportunities are for flying on Air Canada with a few select earning options from Fairmont and Avis. This is unlike the previous two versions which also appeased the frequent shopper portion of Air Canada and the majority of Aeroplan's membership base by offering many methods to earn 'Wings' which later translated into Aeroplan miles. The premise of this and past Earn Your Wings promotions is to earn Wings by completing various earning actions. In this third version you will receive 2,000 Bonus Aeroplan Miles for every 2,000 Wings collected. The more 'Wings' you collect the more Aeroplan miles you earn with a maximum of 750,000 Aeroplan Miles awarded per individual. If you end up in the top 20 Wings earners you will get an equal share of 10,000,000 Aeroplan Miles (500,000) over and above the miles you earn from the promotion. Earn a minimum of 100 Wings for every take off and for every landing on any Air Canada (including flights operated by Air Canada Express) and Air Canada rougeTM flight. This translates to a minimum of 200 Wings per flight segment. There are 62 airports that will earn a higher amount of Wings for every take off and every landing. Refer to the list of cities that will earn Destination badges. Finish in the Top 20 and earn your share of 10,000,000 Bonus Aeroplan Miles. To participate in Earn Your Wings you must be an Air Canada Altitude member and register online at: http://earnyourwings.aircanada.com/ by October 3rd. Flights booked between August 25th and October 3rd that are completed by November 30th will count towards earning your wings. Feel like royalty every time you take off or land at any 2 of the 3 following airports: Paris (CDG), Milan (MXP), Madrid (MAD). From East to West, take the scenic route! Earn this badge every time you take off or land at any 2 of the 3 following airports to earn this badge: Winnipeg (YWG), Quebec City (YQB), Halifax (YHZ). A toast to you! Indulge in the sand and sun and earn this badge every time you take off or land at any 2 of the 4 following airports: Mexico City (MEX), Kingston (KIN), Montego Bay (MBJ), Bridgetown (BGI). Visit these unique urban waterways and earn this badge every time you take off or land at any 2 of the 4 following airports: Manchester (MAN), Paris (CDG), Venice (VCE), Copenhagen (CPH). Explore the great Pacific coastline and earn this badge every time you take off or land at any 2 of the following 4 Pacific Coast airports: Sydney (SYD), Tokyo Narita (NRT), Tokyo Haneda (HND), Seoul-Incheon (ICN). Travelling through the province of this emblematic flora? Earn this badge every time you take off or land at all 3 of these Ontario airports: Ottawa (YOW), Thunder Bay (YQT) and Toronto's island airport (YTZ). Experience the zest of travel and earn this badge every time you take off or land at any 3 of the following 5 Sunshine State city airports: Miami (MIA), Fort Lauderdale (FLL), Orlando (MCO), Tampa (TPA), Fort Myers (RSW). The dynasty is gone but the splendour remains! Earn this badge every time you take off or land at any 2 of the 3 following airports: Hong Kong (HKG), Beijing (PEK), Shanghai (PVG). Awarded when you take off or land in Toronto’s island airport, Ontario. Awarded when you take off or land in Washington D.C. – Dulles. Awarded when you take off or land in Fort Myers. Awarded when you take off or land in London Heathrow. Awarded when you take off or land in Tokyo-Narita. Awarded when you take off or land in Tokyo-Haneda. Awarded when you take off or land in São Paolo, Brazil. Awarded when you take off or land in Montego Bay, Jamaica. Awarded when you take off or land in Kingston, Jamaica. Awarded when you take off or land in Bridgetown, Barbados. Earn 500 Wings simply for registering and having Air Canada Altitude status. You must register between August 25 and October 3 inclusively to earn this badge. Congratulations on making it to the top! Earn your share of 10,000,000 bonus miles for landing in the final Top 20 of the leaderboard on March 16, 2015. This badge will be awarded on March 17, 2015. More Wings, more miles! Receive this badge once you accumulate 25,000 Wings and earn 2,000 Wings! Reach for the top! Receive this badge once you accumulate 50,000 Wings and earn 2,000 Wings! Watch this space and check your email for more details of a new badge offer. Watch this space for more details of a new badge offer.